Two recent vintage acquisitions. 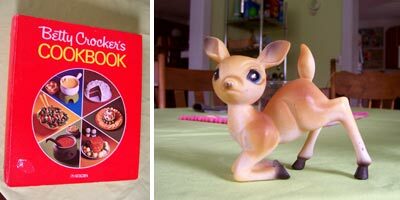 I finally got the Betty Crocker Cookbook from my mom and I got this little plastic deer from my grandma. I can feel a baby fawn collection urge coming on. I love the Babycham fawn! I have a pair of vintage babycham glasses with it on- I think you can get little models of it too- try eBay! My mom has and still uses that cookbook. Bailey said - "My mom has and still uses that cookbook." OMG - I have and still use that cookbook! I love the babycham stuff too!